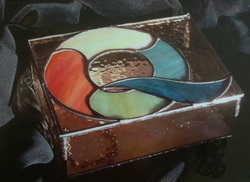 This lovely box was created for the owner of a business that used her first initial as her business logo. This special gift was given to the owner of this company. 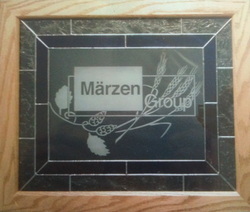 The business logo depicted was sandblasted onto the transparent glass and then surrounded by the company color of cobalt and clear glue chip glass. Any business logo that has a crisp design can be transformed into a work of art. "Ryan Family Coat of Arms"
The Ryan coat of arms was presented to the patriarch of this family with great love and admiration. 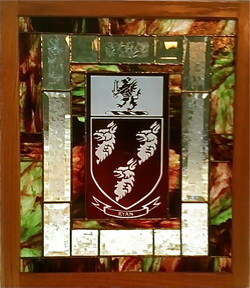 The coat of arms image was sandblasted onto red flashed glass and then surrounded by rich reds, greens and glue chip bevels.